The patches are ready that will add native Prepar3D V3 support to both UTX USA and UTX Europe. Before running the patches, you must be running UTX USA V2.1 and UTX Europe V2.1. We will make an official announcement regarding these patches after a few days. Right now we are only announcing them in the forum. All that is left now is Tropics and Alaska.. GEP3D is already preprogrammed for when you release those. OK. I might know what is going on. The patch has a check to make sure it is being installed to the most recent version of UTX Europe, which is version 2.1. So, the patch is looking for the UtxEurV21Fsx.exe file. I put this in to make sure that users are installing the patch to the correct folder. So, you will need to upgrade to UTX Europe 2.1 before running this patch. I need to change the requirement. BTW. I changed the patch requirements to V2.1 for both the USA and Europe. No problem. I will explain. 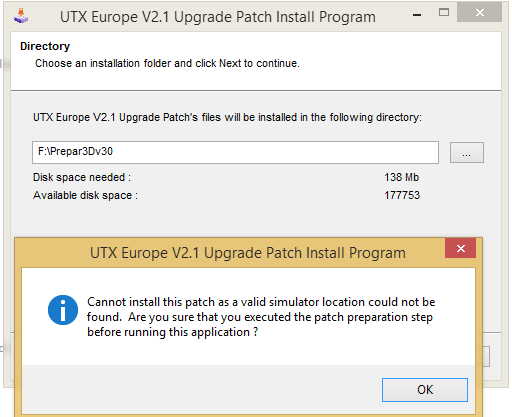 First, if you have not installed UTX Europe yet and you currently have the 2.0 version, just download the full 2.1 version of UTX Europe from Flight 1. When you have version 2.1 installed, the Prepar3D V3 patch will find the correct files. Here is the link to the full V2.1 installer if you need it. There is no upgrade charge for 2.0 users of course. After installing UTX Europe V2.1 and you then run the IMUtxEurPatchP3D3.exe patch, you will see 2 additional files in the same folder. These files add P3D V3 support to the Install Manager. The patch also edits the IM.INI and adds a few entries so that the Install Manager knows to look for the new files. This is a very good question and thanks for bringing it up. You are correct that the UTX Europe V2.1 patch itself won't change the Install Manager filenames. I think this is why I never officially released the patch in the UTX Europe forums and instead changed the full download of UTX Europe to version V2.1 on the Flight 1 site. I need to remove the patch link from this forum. Those that need to upgrade should just download the full version. Hopefully, this won't be too much of an inconvenience. Thanks for the feedback. Please everyone keep me posted as to any issues that come up. Ah after seeing your last post I think a new full download is in order and I will not need the patch ? You should uninstall the "Install Manger For UTX Europe" before installing the full version 2.1. Sorry about the confusion everyone. I did not anticipate the fact that some users could be running UTX Europe V2.0, which causes problems. Yes. You can tell the version from the filenames in the UtxEuropeIM folder. I'm no stranger to UTX but I am confused still/again. I have a machine with just P3D v3. I have the new UTX Canada 2 already installed on it. So, how to install USA and Europe? Download new again from F1? So do we need to still patch it or will it work out of the box ? Clayton. You only need to download new versions if your existing versions of the UTX Europe and/or USA installers are V2.0. You should be able to tell by the installer filenames after you have extracted the installer from the ECommerce wrapper. If you have V2.1, you should see '21' somewhere in the filenames instead of '20'. I believe the UTX Europe V2.1 installer is named "UtxEur21IM.exe". 1) Install the full retail release of UTX Europe V2.1. 2) Install the Prepar3D V3 patch. Hopefully, LM will slow down when it comes to redesigning their Prepar3D registry and folder structures. Or at least give you guys some advance notice. Seems like there is a disconnect. With all the people claiming to be beta testers, how come the developers always seem so surprised and hence, pissed off? Anyway, thanks for clarifying the install/update process. Honestly, a lot of this falls on us developers. We could get on the beta team if we were proactive enough about it. I am certainly not angry with LM, just surprised that they made another big structure change after doing it in Prepar3D V2.5. Prepar3D seems to be growing. But, is still a smaller market share than FSX/FSX-SE. P3D V3 does seem like another step forward though. And, we all need to keep the flight simulator market from getting too stagnant. Same here but one more question. Regarding the USA/Canada border fix patch, does it still go in? Regarding the USA/Canada border fix patch, does it still go in? Thanks Jeff and Allen. USA 2.2, Europe 2.1 and Canada 2.0 all in P3Dv3 and doing their thing. Just an FYI. All future "official" patches will either be "content patches" or "platform patches". "Platform Patches" are those that only add platform support to the "UTX Install Managers". These patches don't change any UTX features at all. Hopefully, we won't have a need for any more of these types of patches for a while. The Prepar3D V3 patches that we just released are "Platform Patches". "Content patches" are those that are independent of any platforms and actually change UTX content. A content patch will apply to all platforms. The UTX USA V2.2 patch is an example of this type of patch. At times there may also be minor "unofficial" patches released. These patches may do something that only impacts users with other 3rd party addons. For example, we have released unofficial UTX texture changes to match another product better in the past. With all the new platforms these days, we are trying to come up with a structure that can be clearly documented and understood by our users. Patches are frustrating for both developers and users. And, you have to find the right balance between patch release times, because some users love frequent updates and others hate them. I am having the same message for UTX USA: I had V2.1 installed, then ran the P3DV3 patch, which installed successfully and then ran the USA Patch 2.2. I pointed to the right simulator location and launched the patch prepartion which completed ok, but then when launching the patch itself I had the same warning above. It looks like you are trying to run a UTX Europe Patch, not USA ? thanks ...I resolved the issue by removing and reinstalling UTX USA V2.1. I then ran the P3DV3 patch and then the UTX USA patch 2.2 and this time it worked. I probably messed something up during the previous install. Thanks for your answer anyway. I have P3dv2.5 installed on a limited space SSD. All my scenery, Orbx, Megascenery, and most importantly UTXUSA & UTXEUROPE, reside on on the I:\P3dv2.5 root drive, a 250GB partition of a 500GB SSD, L: drive,the rest of the SSD holds other scenery. The rest of my scenery,750GB total is also shared on a fast USBv3 external drive labeled L:. I have been using my scenery.cfg and terrain.cfg from P3Dv2.5 to the P3dv3 appropriate folder, and everything seems to work fine in v3, which shares space on I:,...except UTXUSA and UTXEurope. it becomes obvious that the payback to run v3 surpasses that of my cozy V2.5 install. PMDG forced me to decide between v2.5 and v3, and I am hoping you will not do the same. 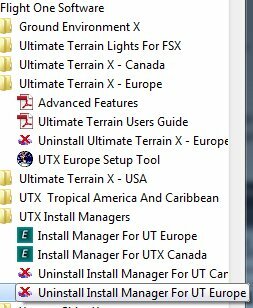 Is there a way to reference my already installed and functioning P3dv2.5 UTXUSA and UTXEurope installs to work as my ORBX installs do through copying my scenery.cfg and terrain.cfg , in V3? Or do i have to uninstall my v2.5 UTX files to RE-INSTALL UTX into P3dv3? ...cause I don't have room on my SSD for TWO identical UTX installs. I hope I have made myself clear in my admiration for UTX AND need to keep my use of same without interruption...however it can or must be....happy to fill in any omissions. UTX is designed to be installed into the root folder of the flightsim platform so is not setup to be shared across multiple versions. While it might be technically possible to hack this to work I'd guess it would involve creating manual shortcuts for hundreds of folders and files. It would not be worth the trouble to try and document such a fragile and unsupportable solution. I'd estimate that the space you would need for the UTX USA and UTX Europe installs into P3D v3 would be around 6 Gb. 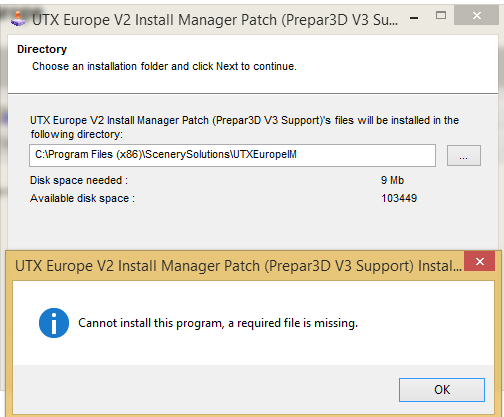 As noted in the first post of this thread there is a patch process you need to go through to provide the UTX install manager ability to install into P3D v3. I went ahead and bit the bullet and did the patch and install into v3, cause I just couldn't do without UTXUSA! V2.1 is ensconced in P3dv3 in all its glory and I am happy camper! Course I don't know whether the P3dv2.5 version is still there, I'm too tired to check for tonight. What you ask for is included in the patch documentation PDFs listed in the very first post in this thread. Hi .... thought I was home and dry but no ... when I try to run both Install Managers I get the message: Attempt to call installer failed ... may need to run this application as Administrator ... ??? Yes, as noted in our FAQs and in numerous posts in this forum, you should always look to run installers and the UTX Setup Tool by right-clicking on them and selcting "Run as administrator". Also make sure that you are not trying to run the installers from inside the zip archive and/or a read-only location.